Have you found an online vendor selling Dictador Amber 100 ? Tried a glass of Dictador 100 Amber while vacationing in Versailles. Boring bottle design. Golden color. Alcohol to the nose. If you pay attention, there is a hint of Dictador rum lurking behind all that un-matured alcohol smell. Taste test reveals a very young and immature flavor profile. Burn follows at the end. What else do you expect from a 100 month aging process. In the interest of full disclosure I approach my personal review knowing that Dictator is one of my favorite brands. As with the Dictador Claro 100 (which I reviewed earlier) the "100" refers to how many months it has been aged (a little over 8 years). The hue becomes a nice shade of mahogany with bronze highlights.. I repeat myself but just as with the Dictado Claro 100 the metal screw cap was substandard and would not release thereby stripping the groove and making it difficult to open. Eventually I managed to get the stupid thing OFF the bottle by using my Spyderco pocketknife (without ruining the point BTW). Apparently I am not alone with this gripe. Hopefully someone there will get the hint. I noticed very good legs when I swirled it around in my snifter. Lengthy streams. The aroma is quite nice. I detect butterscotch, toffee, and some vanilla in the initial flavor along with natural sweetness. Some oak and pepper, but not all that much surprisingly. It is quite smooth with little burn. The finish highlight the butterscotch and vanilla flavors which slowly fade enticing one to take another sip. Along with the Dictador Claro 100 this is a very nice sipping rum. I've given both an 8 but if I had to choose, the Amber would be my choice over the Claro but both would be welcome. I must collect something, else i get crazy, so why not Rum? I really enjoy this rum when you are looking for something nice but don't want to dip into your special bottles. Průměrný rum. Neurazí, ale ani nenadchne. Chuť je výrazná a ostřejší. 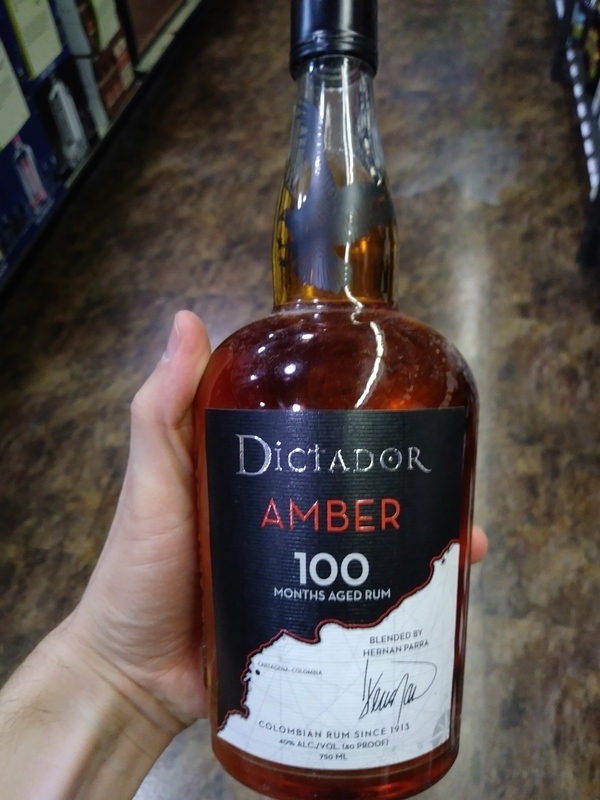 when you look at Dictador's lineup, you have to ask yourself where does this one fit in... it's definitely not aimed at true rum drinkers... does that mean it's aiming squarely at Bacardi drinkers? if the latter, it makes sense. if the former, you are ruining the brand image for brand's other products. But that isn't an incredibly high accolade. Some coffee and toffee up front in a very sticky way. Then transitions to harshness but with a nice caramel backing. But it didn´t rock my boat either.. Some hint of coffe and some taste of alcohol.. Will we a drink rum for me..